ENGEL AUSTRIA and PMEfluidtec GmbH, a company based in the German town of Ettenheim, have announced their partnership in the field of water injection technology (WIT). The collaboration will encompass client-specific system solutions and world-wide sales. 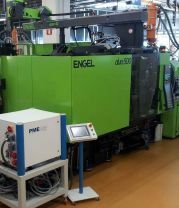 The water injection technology offered by ENGEL under the ENGEL watermelt label is used for the efficient and cost-effective production of long media lines and complex hollow parts such as handles, beverage crates and engine components via injection moulding. The injection of water into a cavity partially filled with plastic melt ensures even wall thickness distribution and smooth internal surfaces, even where part geometries are complex; other advantages include the economical use of raw materials and short cycle times. For 12 years, PMEfluidtec has been developing and producing systems for fluid-based injection moulding using internal pressure technology. The company is therefore a pioneer in the field. Under the terms of the partnership, PMEfluidtec will be responsible for WIT systems and process and mould technology as well as service for WIT units; ENGEL will be responsible for adapting injection moulding machines, automation and peripheral units. Both partners will advise customers on application-specific issues. ENGEL is consistently building its expertise as a system supplier to ensure its customers benefit from efficient processes and high levels of competitiveness. By working with system partners, all of whom are leaders in their field, the company is breaking into a wide range of technologies. Other partners include Trexel (for MuCell foam injection moulding) and Bauer Kompressoren (for gas injection technology).